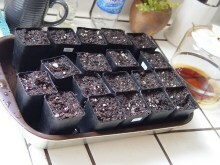 I took 2 crops of dahlia cuttings that would benefit the DSC. 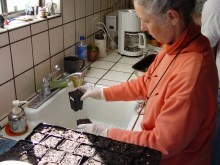 The first crop consisted of 160 cuttings taken on Feb. 8 with the able assistance of Melissa and Sara. Most of these were subsequently brought to the March DSC meeting. 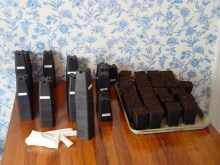 The second crop comprised of 256 cuttings that were taken on March 5 with the enduring help of DJ and Sara. Most of these will be brought to our annual Plant and Tuber Sale on April 2. 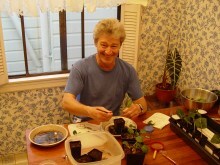 Lou at the "Cutting Laboratory"
Always the experimenter, I decided to try some "leaf bud" cuttings along with the more traditional "tip" cuttings. 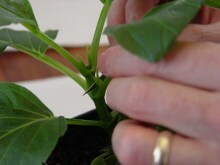 The usual tip cutting is taken by removing the growing apex of a lateral, along with at least 2 leaf nodes. The leaves of the lower nodes are removed and provide sites for roots to emerge. The leaves at the upper node are retained to provide energy for the cutting via photosynthesis. 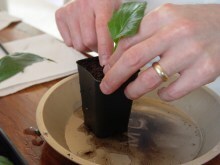 In contrast, leaf bud cuttings consist of a leaf, a leaf bud (between the leaf and the stem) and a length of stem. 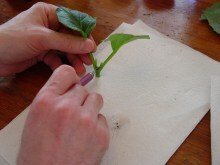 The cuttings are prepared by pinching out the lateral's tip 1-2 weeks before the cuttings are taken. This stimulates the leaf buds into development. 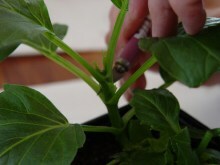 At cutting time, the stems are cut between the nodes; which gives separated leaf pairs. 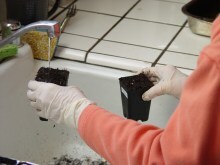 Each of these are then split down the length of the stem to yield two leaf bud cuttings. 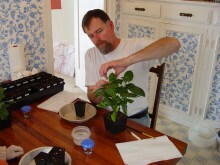 DJ practicing the art of cutting The main advantage of using leaf bud cuttings is that many more cuttings can be taken from a given lateral. 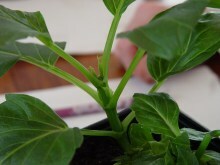 A stem with 3 leaf pairs could yield 1 tip cutting or 6 leaf bud cuttings. 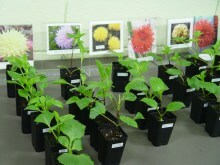 The disadvantage is that leaf bud cuttings have a higher mortality rate. 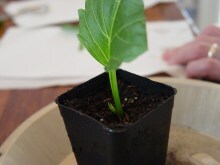 Three and a half weeks after the first crop of cuttings were taken, 95% of the tip cuttings had rooted, compared to only 76% of the leaf bud cuttings. I really prefer the tip cuttings because they are so dependable. 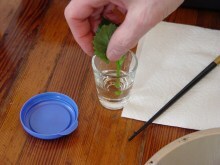 But if I needed to quickly multiply a few precious plants into masses, leaf bud cuttings are definitely the way to go. A tip cut or a leaf cut?